Photo by Asia Morris. The City of Long Beach presents rendering of the Outdoor Office to the public Tuesday. The John S. and James L. Knight Foundation announced Tuesday that 37 innovative projects will share $5 million as winners of the Knight Cities Challenge. Two of those winning ideas were conceived in Long Beach, for the benefit Long Beach. Placemaking the Vote, by City Fabrick, was selected to receive $153,600 for the development of a kit for creating temporary pop-up social spaces at voting polls, specifically in low voter turnout areas in Long Beach. The mission of the space is to not only encourage more people to vote, but to celebrate democracy afterward. Additionally, the Outdoor Office by the City of Long Beach’s Innovation Team will receive $300,000 to transform part of a public park into a space that encourages creativity, collaboration and productivity, according to the release. The projects submitted by City Fabrick and the City of Long Beach’s Innovation Team were chosen out of more than 4,500 ideas centered on making the 26 communities where Knight invests “more vibrant places to live and work,” and were just two of a total of five submissions from Long Beach selected for finalist consideration. In their submissions, innovators answered the question: What’s your best idea to make cities more successful? Winning projects were selected in 19 of the 26 communities across the U.S. where Knight invests, and included exploring Detroit’s untold history through monthly bike tours, to creating a new cultural hub in West Palm Beach’s Northwest Historic District, according to the announcement. An early vignette of the Placemake the Vote proposal, courtesy of City Fabrick. City Fabrick’s first steps to implement “Placemake the Vote” will involve consulting with its partners on the project, Long Beach City Clerk Maria Garcia, along with her office, and Long Beach Rising!, a coalition of community partners focused on expanding voter engagement, to identify the polling sites for prototyping the pop-up plazas, and to clearly divulge their goals for each of those communities, explained Brian Ulaszewski, City Fabrick’s Executive Director. The first pop-up plazas are expected to be implemented during the June Primary Election, while City Fabrick plans to start using them more widely during the November General Election, said Ulaszewski. “It was very coincidental timing that the Knight Foundation announcement was to be made on our local election day,” he said. For the Outdoor Office to happen, immediate next steps will include finalizing the grant award, reaching out to the project’s stakeholders and presenting the grant agreement to Long Beach City Council for approval, according to Rachael Tanner, program specialist for the City Manager’s Office. The full project, a collaboration with Commune Communication, city departments and local stakeholders, is expected to be completed by the end of next year. 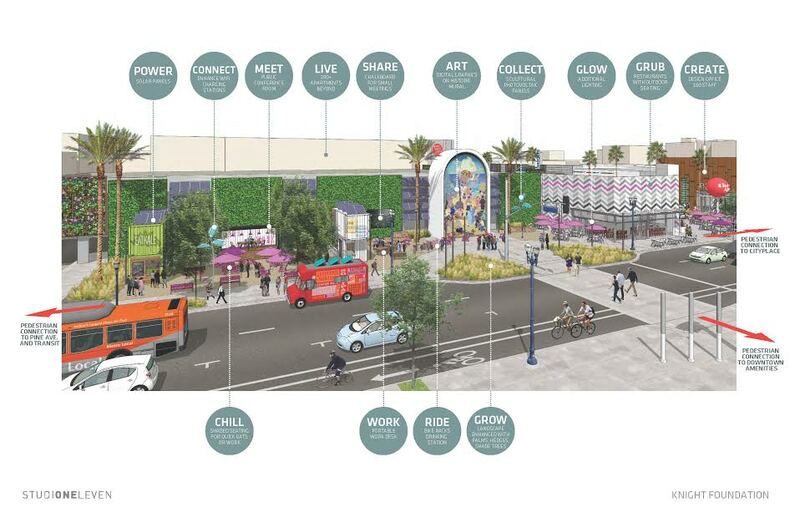 The City of Long Beach stated that the above rendering is only a conceptual image that was included in their Knight Cities Challenge grant proposal. It is not the final design, as the process of community engagement has yet to begin. Nothing will be removed from Harvey Milk Park. This is the second year the Knight Cities Challenge has taken place, with the applications made available in October 2015 and the finalists announced in January. In March 2015, Knight announced 32 winners of the inaugural Knight Cities Challenge, including two applications from Long Beach that qualified as finalists. The challenge will reopen for submissions in fall 2016. For more information on the Knight Cities Challenge, click here and for a list of winners, click here.